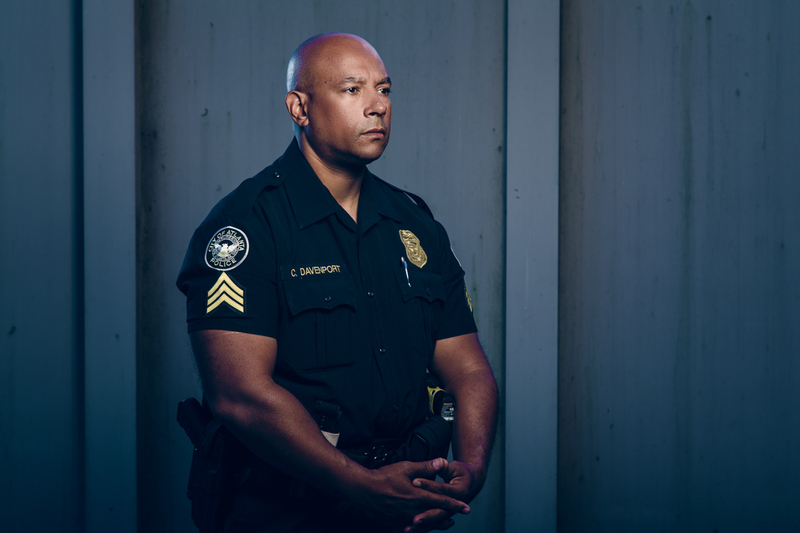 Black and Blue: The voices of African-American police officers. First in a series. At the end of an unmarked driveway in a wooded area of southeast Atlanta, past the SWAT team barracks and armored vehicles, next to the firing range where bullets pierce paper heads and hearts, Sgt. Curtis Davenport teaches police how not to kill people. 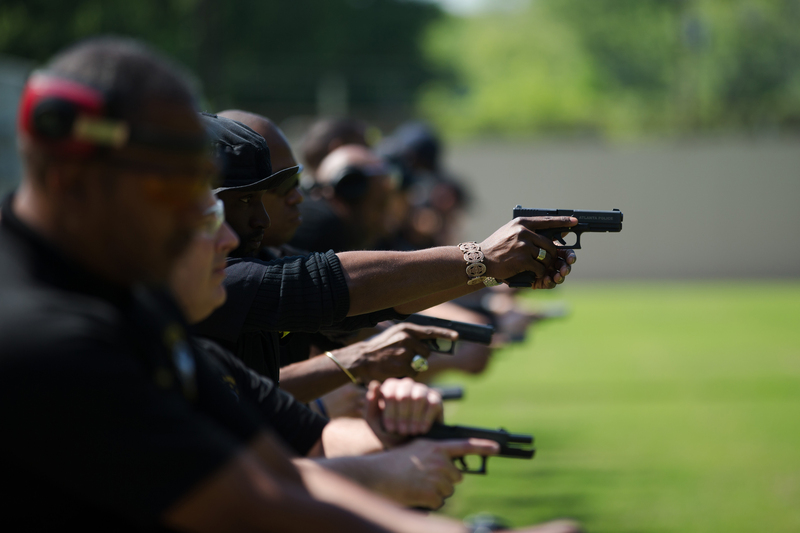 As commander of the firearms training unit, Davenport’s basic responsibility is to make sure Atlanta’s 2,000 officers can hit those paper targets. But over the past five years, as police killings of unarmed African-Americans caused a national uproar, Davenport’s job evolved to include “de-escalation” training — encouraging police to avoid pulling the trigger at all. Surrounded by all this deadly force, Davenport began his mission of peace. He had invited me to attend his two-hour class, shoot on the range and participate in a video simulation of dangerous police encounters, all to help counter today’s anti-police narrative. The backdrop was the city of Atlanta, cradle of the civil rights movement and the modern black mecca, where 54 percent of the population and 58 percent of the police are black. Atlanta is one of the few major American cities where the police force comes close to reflecting the diversity of the population — which has not deterred Black Lives Matter protests and activism within its city limits. Davenport is 50 but looks 35. He still has the muscular physique of the college fullback who reached the last round of cuts at Atlanta Falcons training camp. He can talk with the spin of a politician — Davenport was the Atlanta Police Department spokesman for three years — or break fool like your country cousin. He can quote Scripture or Ice Cube. Relying on the laws of God and man, he walks the tightrope between black and blue with serenity and confidence. Yet, after 27 years in uniform, he sees the world through a blue lens and can’t help but feel the pressure. “The public demanded that police be reformed down to their training, and this is one of the results,” he said, citing former President Barack Obama’s Task Force on 21st Century Policing. “So they came up with this course, and if I were to sum it all up in a phrase, it wants the police officers in America to get out of the warrior mentality. And they want you instead to adopt what’s called a guardian mentality. For the resistant cops, Davenport offered three options: You can change. You can keep acting the same and get fired, possibly indicted. Or you can quit. He covered tactical details such as how distance determines appropriate force. He reviewed what every officer already knew: The law allows you to shoot unarmed suspects. Always shoot at center mass — not at a leg or shoulder. Shoot as many times as necessary to end the threat. But if you shoot one unnecessary bullet, it can cost you your job or your freedom. Over and over, he advised officers to control their egos. Everybody who wears a badge has a big ego, he said. “That is our biggest hindrance. There was a caveat, though, that explains why many police who kill unarmed civilians are not prosecuted. Sgt. 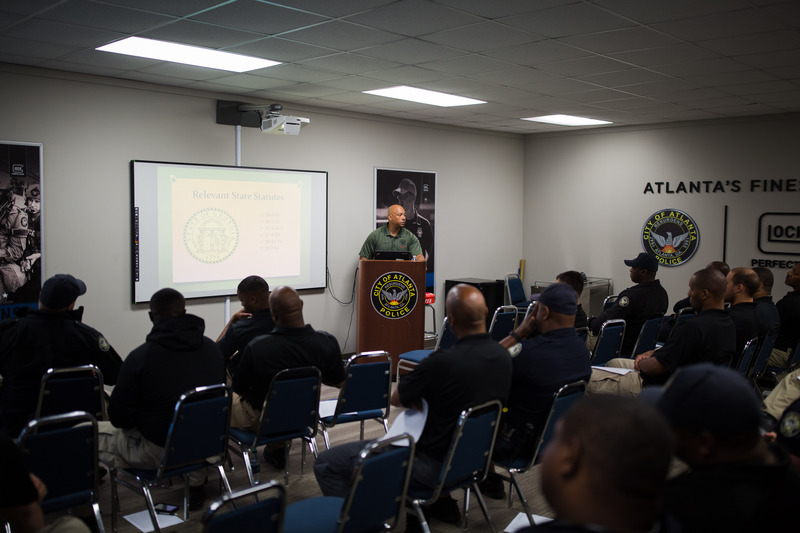 Davenport works with officers in the classroom of the Atlanta Police Department Pistol Range on how to de-escalate situations and what indicators might lead to drawing one’s weapon. Officers work on their accuracy on the shooting range to ensure they do no more damage than is necessary to subdue an attacker. Photos by Kevin D. Lilies. Davenport was born and raised in the city, with summers spent on his grandparents’ rural Georgia farms. After graduating from Lithonia High School east of Atlanta, he earned a computer science degree at Clark Atlanta University while playing football as a 5-foot-10, 260-pound battering ram of a fullback. In four college seasons, he had four carries for 4 yards and four touchdowns. The running back he blocked for got drafted. Despite stone hands and slow feet, Davenport almost made the Falcons from their 1989 training camp. He still feels like he has one more bone-crunching block in him. 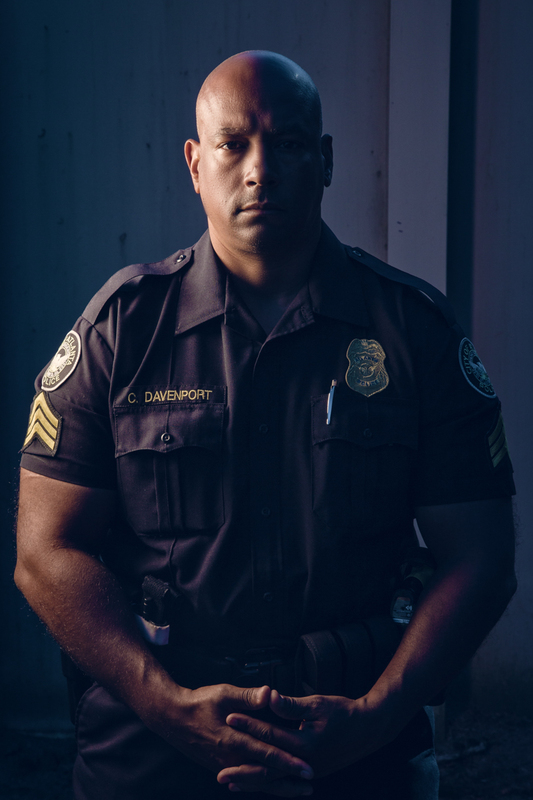 After football, Davenport needed a job and the police department was hiring. 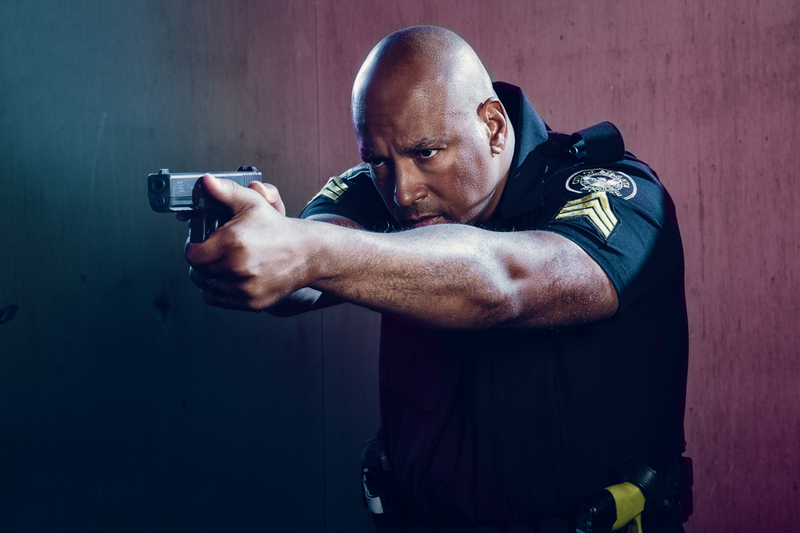 His physicality served him well when he began patrolling Atlanta’s roughest neighborhoods in 1991 and became an undercover narcotics investigator in 2005. Arrests led to lots of fights — “You’re taking somebody someplace they don’t want to go.” He has a scar on his thigh from being bitten by a 300-pound woman who wanted no part of his handcuffs. He trained in taekwondo, kung fu and ground fighting. He learned how to head off physical battles just with the bulge of his arms and chest beneath his tailored uniform. He’s 230 pounds now, still works out ferociously, would like to be 215 but his wife bakes a mean batch of cookies. Davenport was raised in the church and was saved in 2002. Giving his life to the Lord made him more patient and tolerant, and also unwilling to take shortcuts that some officers considered permissible. The bullets on his desk looked more lethal now. Davenport closed his Bible. “I ain’t asking you to agree with it,” he said. “I’m just telling you what it says. “When I put my actions up for judgment, I didn’t put it up for your judgment,” Davenport said. “Sometimes, by pleasing him, I don’t please them. I thought about the off-the-books lawmaking “contempt of cop” punishable by a night in jail, and remembered Freddie Gray running from police, getting cuffed and then being carried out of the police van with a broken neck. Last June, the police chief asked Davenport for his expert opinion of a video that showed an officer punching a man in the face while trying to arrest him. Davenport referred back to his secular Bible — the Standard Operating Procedures of the Atlanta Police Department. The officer was suspended for 20 days without pay. That upset the rank and file, as the arrested man had a reputation for fighting back against police. Davenport said that a few years ago the officer would have received little to no punishment. I asked whether that’s a positive development. Davenport recognizes that mass incarceration has devastated the black community. He believes African-Americans are treated unfairly in the justice system. But he sees another part of the equation too. It was time to shoot on the range, a manicured green quadrant with a steep hill of red dirt at one end. Davenport outfitted me with a holster and police-issue 9 mm pistol. He instructed me how to hold the weapon, sight down the barrel and ignore the “unnatural event” of setting off a tiny bomb in my hand. Pulling the trigger took as little effort as turning on my phone. A hole appeared in the paper person’s head, and I was filled with sadness at the thought of black boys carrying death in their pockets. It was very comfortable riding in the black leather passenger seat of his new Ford F-150 King Ranch pickup. We pulled up to his five-bedroom brick home at the end of a cul-de-sac in the suburb of Decatur. Inside the garage was his beloved 2007 Harley-Davidson Street Glide, parked near a black leather jacket emblazoned with the name of his old motorcycle club, the Buffalo Soldiers. Davenport and his wife, Valerie, who works in the UPS finance department, bought the house out of foreclosure in 1996. Curtis and Valerie, an amateur bodybuilder, cooked Sunday dinner together in their cozy kitchen. Their pit bull puppy, Bella, rescued from a shelter, scampered underfoot. Curtis dropped steaks and salmon on the grill. Valerie sautéed cabbage and prepared mac and cheese and cornbread. A box of takeout fried chicken sat open on the island counter. Crab legs boiled, sending enough “Slap Ya Mama” seasoning through the air to draw a cough. Nothing special, this spread. Just a regular Sunday. Their sons arrived: 23-year-old Clayton, who attended Alabama A&M on a football scholarship and now works as a plumber, and 21-year-old Cameron, who went to work for CSX Railroad out of high school. Next came Davenport’s father, Jimmy, and his stepmother, Karen. Jimmy and Karen got married when Davenport was 16; he calls her Mom. Last to arrive was their daughter Sydney, 20, a sophomore at Albany State University. A lawnmower buzzed outside, pushed by a former Atlanta police officer who went to prison in the aftermath of a scandal over falsified search warrants. Davenport could mow his own lawn, but the former officer needs the work. Sitting in a paid-off house, bellies full, paychecks steady, driveway full of cars, the Davenport family’s biggest immediate concern was whether the Falcons could make it back to the Super Bowl. Curtis and Jimmy have season tickets. Nobody felt conflicted about police work or passionate about Black Lives Matter. When the brownies and ice cream came out, I asked whether the family had argued over any of the recent high-profile police killings. Davenport told his family all along that Wilson would not be charged with a crime. There was no apparent distinction between “would not” and “should not” in Davenport’s mind. According to the Justice Department report released by former Attorney General Eric Holder, Brown punched Wilson in the face when confronted, grabbed his gun, was shot in the hand, ran away, then charged back at the officer. The law allowed Wilson to shoot Brown. When the killing first hit the news, Davenport’s father, Jimmy, was angry. A retired post office supervisor, he was born in 1947 in Wedowee, Alabama, where segregation was the law, white people called him “boy” and there were no black cops. But once the facts of the case came out, Jimmy Davenport agreed with his son. Jimmy’s wife, Karen, wouldn’t go that far. “Curtis was talking about the law and what the policeman did. I was talking about the broader perspective of policing,” said Karen, a retired school principal and college administrator. “Who became confrontational?” Davenport asked. “If ands and buts were candy and nuts, oh, what a party we’d have,” Davenport said. Everybody laughed. Love filled the room, not the vitriol that tore through America after Brown’s death sparked riots and turned Black Lives Matter from a hashtag into a movement. But the philosophical chasm remained. Karen Davenport saw Brown’s death in the context of policing as a tool of mass incarceration, in a society rife with racial bias. Sgt. Davenport focused on what he teaches in his course — when the law says an officer can pull the trigger. De-escalation is only for nonviolent suspects. Otherwise, do what you do. Atlanta buys its heroin in the Bluff, where addicts and dealers lurk in abandoned houses as children play nearby. Davenport worked these west Atlanta streets as an undercover narcotics investigator, making drug buys and serving warrants. Jumping out of an unmarked van, ready to deliver some justice, that was fun. If a suspect wanted to put up a fight, the crew stepped aside and Davenport took him down. He would masquerade as a junkie, walking shirtless into a drug house or wearing a suit and tie like a downtown businessman. Once he was buying crack in a second-floor apartment when two men burst in, fired their guns in the air, and robbed the drug dealers. Davenport thought about pulling his hidden weapon but decided against blowing his cover. That was the closest he ever came to firing his weapon at someone. In 2006, he was promoted to sergeant and left the squad. Six months later, Davenport’s former narcotics team, led by Officer Gregg Junnier, crept onto a porch in the Bluff, wearing plainclothes. They smashed through the door and burst inside. The homeowner, 92-year-old Kathryn Johnston, thought she was being burglarized and fired her revolver at the intruders. The officers fired back and killed her. At first, authorities said police had bought drugs from Johnston’s house that same day. But Johnston’s neighbors knew she was innocent. Soon it was exposed that Junnier lied on the search warrant, lied on other warrants and was breaking other laws too. Junnier and two other officers went to prison. It hurts Davenport to admit that Junnier, a man he would have taken a bullet for, was a crooked cop. He believes he should have seen it. He wonders how many warrants he served that Junnier falsified. Davenport was never accused of any wrongdoing connected to Junnier’s crimes. But Junnier’s crimes get Davenport accused of wrongdoing just for wearing his uniform. Yet even after the Johnston scandal, which resulted in an overhaul of the Atlanta Police Department narcotics unit, Davenport doesn’t see systemic problems with policing. There’s a difference, though, between outliers on the police force and in other professions. Those 2 percent of bad cops can ruin lives, even take them. Davenport accepts that higher level of responsibility and says police departments need to do a better job of identifying problem officers. After shooting at the range, Davenport took me to the police academy, where pictures of 39 slain officers hung on a wall. Inside a darkened room was the Milo Range Theater 300, a $120,000 system featuring a circle of five huge video screens that create an immersive training experience. Since 2015, Atlanta police have killed nine people, including seven African-Americans, two of whom were unarmed, according to The Washington Post’s national database of police killings. That’s about the same number of killings as the comparably sized cities of Kansas City, Missouri, and Long Beach, California. A half-dozen officers watched as I strapped up with a video-game-type pistol. Davenport said to look for the threat and engage it. I asked what “engage” means. A scene unfolded: A traffic stop of a pickup truck. I approached on the driver’s side and saw an old man behind the wheel. I asked him to put his hands on the wheel — he did not comply. I demanded that he put his hands out of the car window — nothing. The camera backed away. I was about five paces behind the truck. The man got out. I drew my weapon and yelled at him to lay down on the ground. He kept walking toward the tailgate. I yelled I would shoot if he did not lay down. My heart pounded. I felt frustrated and discombobulated by his refusal to obey. Was he sick? Stupid? The old man grabbed something from the truck bed and spun toward me. I blasted him. He fell down and dropped the gun in his hand. The screen went dark. Davenport said I could have shot him sooner. But what if he didn’t intend to pull out a weapon? Another scene: A call about a “disturbance” at a park. Such sketchy information is often all police have to start with. Two young men were talking near a parked car. I questioned them, but they didn’t respond. I put my hand on my gun. They put their hands up and I saw one had a gun in his waistband. A woman suddenly got out of the vehicle and approached me with something in her hand. I almost shot her. She was filming with her phone. I yelled at everybody. She lay down in the road. I felt much more scared with three people than with one. I threatened to shoot the gunman if he didn’t lie down. He bolted toward the woods. I let him go. The screen went dark. Davenport observed that it’s not against the law in Georgia to carry a gun in your waistband. Nobody had broken any laws in that scenario. Another traffic stop. A young woman got out of her car and put a gun to her head. Davenport went into de-escalation mode. He asked her to calm down. “Let’s talk, let’s just talk, you can put the gun down,” Davenport said. She didn’t listen. Davenport kept talking, his gun in hand but pointed at a 45-degree angle toward the ground. Was this a nonviolent subject? Could he shoot? Should he? The woman swung the gun toward Davenport and fired. Davenport let off eight shots. The screen went dark. The technician played back a recording of the encounter. The woman shot first. Davenport’s first shot missed. “This might have been my bad day,” he said. Davenport, an ordained minister for 12 years, is an assistant pastor at Greater Travelers Rest House of Hope Atlanta, performing weddings and baptisms and leading Bible studies. I sat with him one Sunday in a front pew of the majestic 7,000-seat sanctuary, close enough to the concert-grade sound system to feel the stomp-stomp of the bass drum. Black faces filled the ground-level pews and the two balconies. Stained-glass black faces gazed from the windows behind the choir. Cameras broadcast live on the internet. Aged mothers in white hats and dresses were honored. The band played “I’m Nothing Without You,” “Jesus Is My Help,” “The Lord Is Blessing Me Right Now.” Davenport worshipped calmly, tapping his gator-clad toe to the music, with no waving hands or extra amens. Then Dr. E. Dewey Smith Jr. got to preaching about Jonah. God told Jonah to go to Nineveh, but Jonah rebelled and boarded a ship for Tarshish. Smith described how God sent a storm to afflict Jonah’s ship. His honey-coated voice was calm, but we knew what was coming. Smith described how the terrified sailors started praying to their pagan gods and throwing things overboard. The congregation bubbled. Davenport remained silent. Pastor Smith is his friend, but Davenport knew what was coming. The congregation exploded in agreement, a bullet aimed at the heart of a servant who believes in the nobility of policing. Davenport’s face betrayed no emotion as he balanced between the black and the blue.